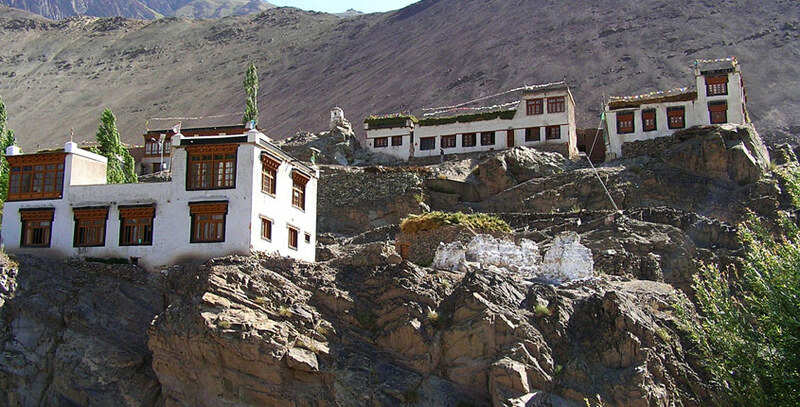 Located in a scenic village of the same name in the Leh district, the Alchi Monastery looks truly astounding. The oldest and most famous monastery was built by the great translator Guru Rinchen Zangpo between 958 and 1055. However, inscriptions in the monastery state it to be of the 11th century. Today it is being monitored by Likir Monastery. The Alchi monastic complex stands out amongst the rest of the attractions in the three villages. This monastery is actually a complex of temples consisting of 4 separate portions that have monuments built at different times. The main complex has three temples- gTsug-lag-Khang (main temple), 'Jam-dpal lHa-Khang (Manjushri temple) and Dukhang (assembly hall). Intricately carved paintings adorn all these structures and are believed to be the oldest surviving in Ladakh. Alchi monastery receives a huge footfall The walls paintings depicting the details of Hindu kings as well as the teaching of Buddhism adorn the site. There is also a huge Buddha statue in the complex which is also a famous tourist attraction.